Front row (left to right): 1. Monte Ferrario, 2. Dennis Bammer, 3. Steve Rundstrom, 4. Steven ?, 5. Larry Vaughn, 6. Donnie Henderson, 7. Oscar Lopez, 8. Tommy Wade, 9. Mariano ?, 10. Floyd ?. Second row: 1. Diana ?, 2. Elizabeth Anderson, 3. Patty Garcia, 4. Margie Reay, 5. Cindy Hill, 6. Sandy Marsh, 7. Debbie Draghi, 8. Glenda Bower, 9. Janice Evans. Third row: 1. Bart Schenone, 2. Dean Preftokis, 3. Dennis Lawless, 4. Steve Nordahl, 5. Sheila Mueller, 6. Kathey Bireley, 7. Douglas Nakken, 8. Bobby Ray, 9. Kent Yarborough, 10. Richard Fletcher. Standing behind the class: Mrs Juanita P. Mettler. Credits: From the collection of Margie (Reay) Kiser. Scanned by Brian McFann. Thanks to Margie Kiser, Karin McMahon Reitz, and Larry Vaughn for identifying the kids in the picture. 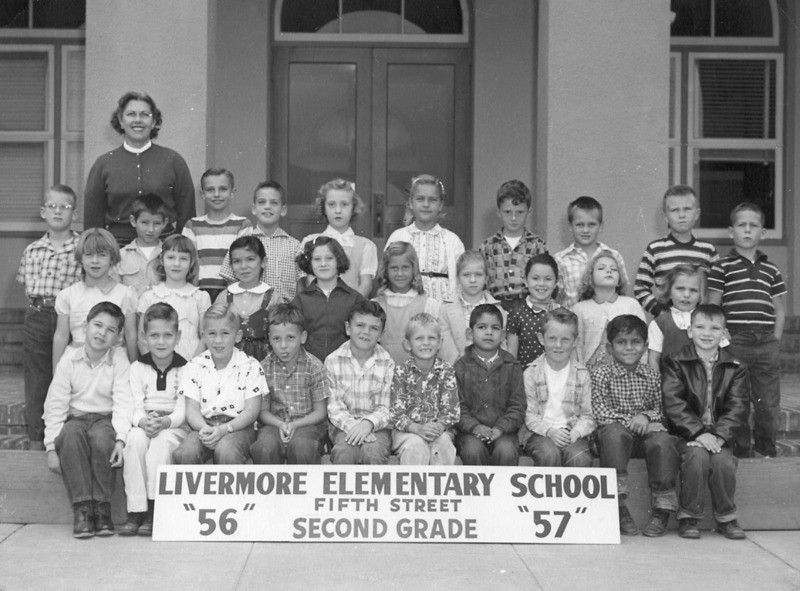 To find other pictures from Fifth Streeet School in the archive, see Livermore class pictures listed by school: Fifth Streeet School. And if you have any pictures from Fifth Streeet School that you would like to share, please submit them to the Archive.